The town was founded in the 1870s. It featured two hotels, a general store, a saloon, a meat market, blacksmith, livery stable, and a notion shop. Starting in the 1870s, the narrow-gauge North Pacific Coast Railroad ran through Duncans Mills on its way from Cazadero, California to Sausalito. After being sold several times, the railroad ceased operation in the 1930s. The town slowly faded, until a 1976 restoration project, associated with the celebration of the U.S. Bicentennial, brought about a period of building restoration and business re-vitalization. Today, Duncans Mills resembles the way it was originally built. It has an authentic Northwestern Pacific Railroad Depot and several original cars from the old railroad line. A California State Park Ranger Station is located in one of the old railroad buildings as the California State Park Store with a selection of books and maps about the area. The Blue Heron Restaurant has served as the destination entertainment center of the town for decades. Restaurants include Gold Coast Coffee and Bakery, Blue Heron Restaurant and Bar and the Cape Fear Cafe. Antiques, gifts, and locally-grown flowers are sold. There are at least three art galleries: mini photos of around the world, local artists, and early California. 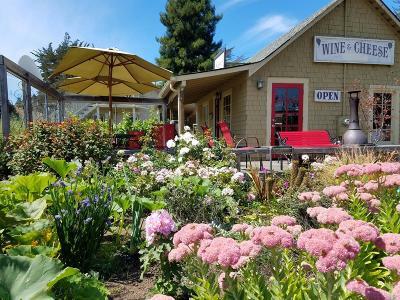 Wine and cheese tastings are offered at Sophie's Cellars. The town draws crowds every summer when it plays host to the Russian River Rodeo. Many Civil War reenactments have been performed adjacent to the town.